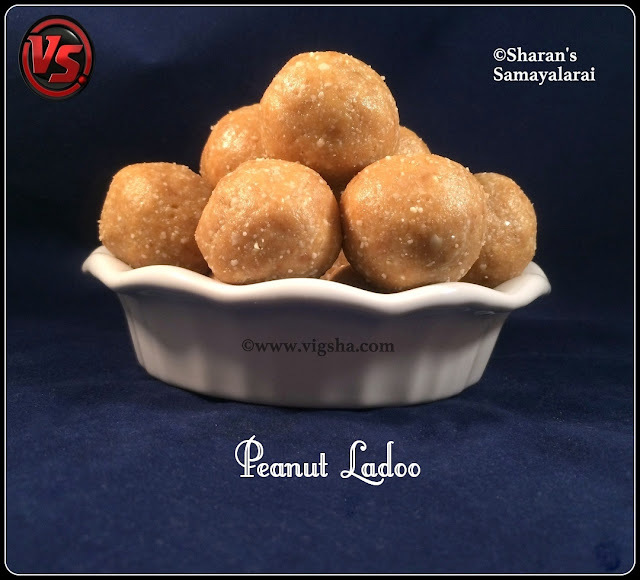 Peanut Ladoo is an easy and quick sweet that can be prepared with just two ingredients. 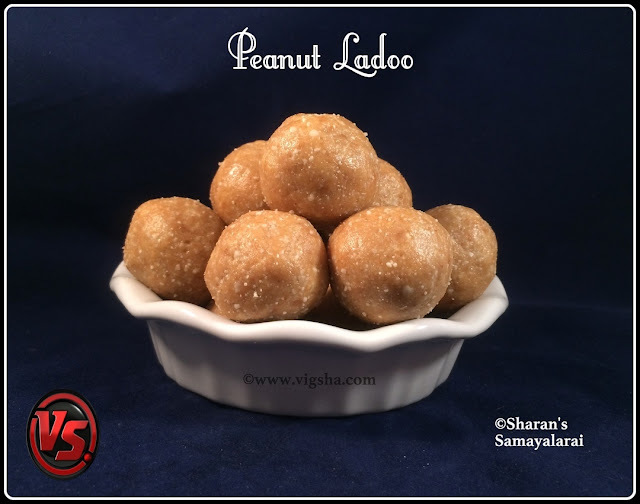 The goodness of jaggery and protein rich peanuts pack in quite a powerful punch! There are many versions of preparing this ladoo with and without jaggery syrup. I am sharing a simpler version that can be prepared in a jiffy. Wishing you all a very happy Karthigai Deepam. Let this deepam bring you brightened & enlightened life like the light of lamp. Click this link for more Karthigai Deepam recipes. I have fascination for these ladoos since childhood and it still continues. I have few good memories associated with it. During my school holidays, my granny will force me to sleep in the noon. I hate to sleep in the day time. So, she will also accompany me so that I will sleep. After she sleeps I would tip toe quietly and sneak into the kitchen to prepare these ladoos. I use kitchen mortar & pestle to grind it and make ladoos. When she wakes up, I surprise her with these ladoos :) I guess this was the first ever recipe I learned. 1). In a heavy bottomed pan, dry roast the peanuts (if using raw peanuts) till it becomes golden color. The skin will start splitting up and you will get a nice aroma from peanuts. Switch off and let it cool completely. Once cool, remove the skin and coarsely grind the roasted peanuts. 2). Add jaggery, cardamom powder and pulse it again so that jaggery blends well with the peanuts. The mixture should come together like chapati dough. Switch off and spread it on a plate. 3). Roll in to small lemon size balls. Enjoy as such or garnish with chopped nuts. Store in an airtight container. # You can replace jaggery with brown sugar or powdered regular sugar. # Make sure to grind peanuts and jaggery together, if you grind them separately they don't blend together. # The moisture in the jaggery and oil in the peanuts will be sufficient for binding. In case, if you have difficulty in forming ladoos, you can use ghee. It will make the process easy and also enhances the flavor of the ladoo.